One of the best man’s most important duties is to plan an epic bachelor party (aka stag party) to celebrate the groom’s final night of freedom before married life. This is the groom’s night, but that doesn’t mean he should get off easily. We’ve prepared this list of funny bachelor party challenges for the groom to attempt. Even if he can only accomplish a few, it should make for a night of hilarious moments. Don’t forget to keep score! Get 50 women to sign your shirt. Find a girl with the same name as the bride-to-be and buy her a drink. 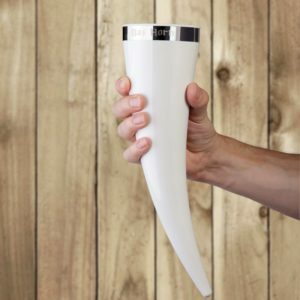 Proudly wear a viking beer horn around your neck all night and ask strangers to fill you up. Give the best man’s phone number to five single ladies. Find a bachelorette party and dance with the bride-to-be. Carry around an inflatable doll for an hour. Introduce her as your fiancée. Buy a drink for a blonde, a brunette and a redhead. Serenade an unsuspecting girl with a love song. Ask three strangers if you’re making a huge mistake. The best man and groomsmen stuff a fanny pack full of embarrassing random items. The groom wear it around all night until he’s handed out all items to strangers. Find a woman who can tie a cherry stem into a knot with her tongue. Make her prove it and then buy her a drink. Wear a ball and chain around all night. Convince a girl to rub the best man’s shoulders. Get a condom from a woman. Get a woman’s phone number. Do a body shot off of a woman. Have a woman do a body shot off of the groom. For every beer or drink the groom gets, make him ask for a girl’s phone number. Every time he gets shot down, he has to take a shot. Have the groom find a girl with really bright lipstick to kiss his cheek. Don’t let him wash it off all night. Have a girl do a naughty dance move for the groom for a drink or beads. Get two girls to kiss each other in honor of the groom’s upcoming nuptials. Convince a stranger that your bride is still a virgin. Find a woman that doesn’t smoke. Offer her a light five times. Try to convince a woman that women should remain virgins until marriage and that men shouldn’t have to. 0-5: Is he already married? 6-12: Maybe a couple more years of bachelorhood wouldn’t be a bad thing. 13-20: Time to cut off the booze. 21-25: Maybe marriage isn’t the best idea for this guy. Want to embarrass the groom even further? It’s never a bad idea to have him wear some type of ridiculous T-shirt or hat that announces to the world that it’s his bachelor party. You can always get creative and come up with your own custom t-shirt design – which we definitely recommend. Have your own bachelor party games or challenges? Drop us a line in the comments. We’d love to hear your ideas. Amazing ideas :). Some of them are really a challenge for a bachelors but these will add more fun to the bachelor party for sure.